The first batch of Apple Watches arrive in users hands on Friday, with a whole batch of tiny little gaming apps waiting to be locked and loaded. Let’s see what might be good in micro-gaming. As of this writing I am not sure if my watch will arrive by Friday or not. I ordered within minutes of the store going live on April 10, but while other folks I know have received shipping notifications, I have received nothing but a sore refreshing finger. Should magic happen and Apple come through, here’s what I’ll be loading up on my Apple Watch come day one. One of my favorite mobile match puzzle battle games gets a wrist-based companion app with the release of the Apple Watch. Send one of the game’s characters on mildly interactive adventures throughout the world of Minutia, bringing back treasures to the main game that can be used to upgrade its insect warriors. Why I want to play: Best Fiends is an awesome game, but its also pretty challenging. My bug warriors can use all the help they can get. Popping boxes along an L-shaped path seems like it would be a relatively easy thing to do on the Apple Watch, what with the small size and everything, but I’m sure Fresh Planet has some tricks up their sleeves when it comes to the Apple Watch version of its puzzle game. There’ll be daily puzzles to solve exclusively on the Apple Watch, which makes you better than people without an Apple Watch. Why I want to play: I am a sucker for a quick puzzle hit while I am using the facilities. From Nimblebit, the creators of Tiny Tower...wait, come back. Stop running. Dammit. For those of you who haven’t fled screaming at the mention of one of the iPhone’s most notorious time sink, Letterpad is an actual game with a goal and stuff. You get nine letters and have to create words pertaining to a certain theme. There are no floors to buy or timers to wait out. Weird, I know. Why I want to play: because I hate it when looking at my watch doesn’t involve word scrambles. TheCodingMonkeys’ adorable order-based tapping game now comes with a tiny version for the Apple Watch. Granted dropping from 16 ordered things to four makes the game a whole lot easier, but its also much smaller, so it all balances out. 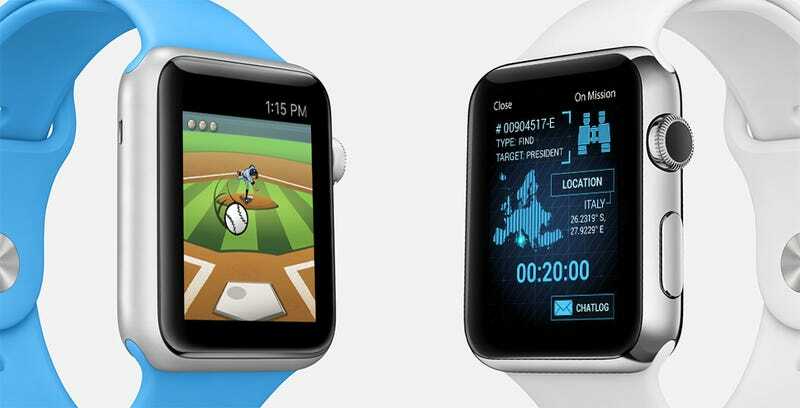 Why I want to play: I cannot lie—I want that tiny robot on my wrist. A turn-based fantasy role-playing game for the Apple Watch, Runeblade is a game in which players journey through the wilderness collecting treasure and killing things. I almost don’t need a “Why I want to play” for this one. Why I want to play: Yeah, I guess I don’t need one. See above. A simple word game in which the player gets four letters and must make a four-letter word out of them. I’ve played similar games on the iPhone and found them maddeningly compelling. Developer Right Pedal is going to cause a lot of extra bathroom time for many people. Why I want to play: I love word games in small doses. This is pretty damn small. From Bossa Studios, the folks behind Surgeon Simulator and I Am Bread, comes a spy management game for exactly the sort of device you’d expect a spy manager to own. The player’s goal is to train an operative and send them on clandestine missions. Communicate with your operative via real-time notifications, complete missions for cash and use that cash for further training and the glory of your agency. Why I want to play: It’s right there in the name: Spy_Watch. Spy watches are cool. Kind of makes me wish I hadn’t opted for the pink sports band now. If you are in any way competitive about trivia, Trivia Crack is a game you should not download to your iPhone or iPad or anywhere else. The game’s most recent update enables play directly from the Apple Watch face, meaning tucking one’s phone in one pocket is no longer safe. Why I want to play: I am incredibly competitive about trivia. God help me. We’ve previously covered Wayforward Technologies’ Apple Watch adventure game, a hybrid experience that utilizes the iPhone for planning and the watch face to execute adventures. Depending on how much fiddling with the Apple Watch you want to do throughout the day you can run either passive adventures requiring no real input or take a more active role, solving puzzles and battling enemies on the tiny screen. Why I want to play: I’m a bit of a Wayforward fan, so even if the game didn’t look like it was right up my alley I’d still give it a go. The first in a series of bite-sized sports games from Atlanta-based Eyes Wide Games, Watch This Homerun is all about hitting a ball with a stick, which is about all the baseball I can stand. Tapping to hit a baseball would have been enough for me, but there’s also a progression-based league system in place, because some people really enjoy that sort of thing. Why I want to play: I love baseball to a point, and this looks to cover that point. Plus my stepfather is a huge baseball fan, and he’ll get a kick out of it. And there we have it. Ten reasons I am refreshing the Apple store order status page over and over again, praying “Processing Items” switches to “Preparing Shipment.” I’ll be staring at my monitor if anyone needs me.